Video #1 - DEP’s invasive aquatic biologist John McPhedran demonstrates how to do a thorough boat inspection in under 3.5 minutes. Video #2 - Developed for Maine’s Courtesy Boat Inspection Program inspectors, this 8 minute video discusses the importance of protecting our lakes and shows how to interact with boaters while walking them through an inspection of their boat. Cost Share Grants: cost share grants for local projects to prevent the spread of invasive aquatic plants - inspections and plant removal. Maine’s Courtesy Boat Inspection (CBI) Program completed its 15th year in 2015. The purpose of these voluntary inspections is to reduce the spread of invasive aquatic plants (IAP) by boats, trailers, and associated equipment to Maine waters. Trained Courtesy Boat Inspectors discuss with boaters the risk posed by IAP, show boaters how to inspect and remove vegetation from boating and fishing equipment, and urge boaters to inspect before and after every launch. The Maine Department of Environmental Protection (DEP) contracted again with Lakes Environmental Association in Bridgton to train volunteers, organize inspections, and manage grant pass through funds to lake groups in 2015. 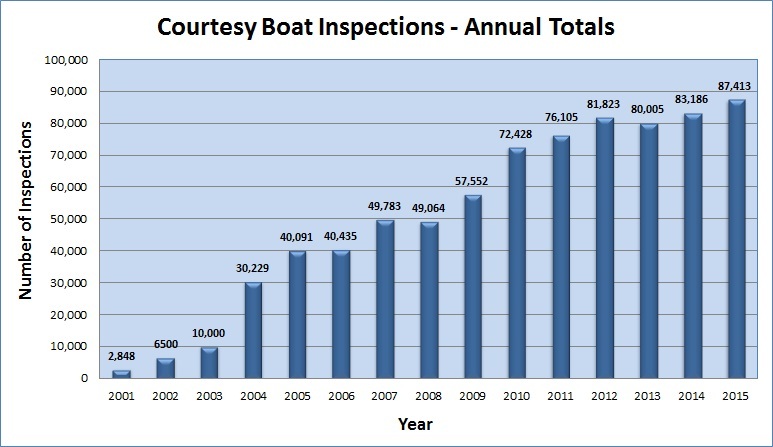 Maine’s 2015 Courtesy Boat Inspection program had another busy season, recording 87,413 courtesy boat inspections, an increase of over 4,000 from last year’s total. To achieve this, 43,591 inspection hours were logged in 2015, roughly equivalent to 21 full-time employees. Boats were inspected both entering and leaving the water with the majority of inspections (58%) conducted on boats entering. Maintaining this high level of prevention effort is a tremendous achievement for local and regional groups running the inspection programs. Once again bass clubs participating in club tournaments were required to conduct inspections as a condition of their permit from the Maine Department of Inland Fisheries and Wildlife. In 2015, 42 bass clubs conducted 5400 inspections at club tournaments.